Browse anonymously with a DIY Raspberry Pi VPN/TOR Router #piday #raspberrypi @Raspberry_pi « Adafruit Industries – Makers, hackers, artists, designers and engineers! Make posted a tutorial for a new project over at their site- Browse anonymously with a DIY Raspberry Pi VPN/TOP Router. Surf the Internet securely with your very own portable WiFi VPN/TOR router. You can configure a Raspberry Pi with Linux and some extra software to connect to a VPN server of your choice. The VPN connection encrypts your internet traffic so that hackers and spies can’t figure out what web sites you are visiting, and the web sites you are visiting can’t tell which computer you are surfing from. The router is small and portable, so you can plug it in anywhere, adding secure internet browsing to any occasion, from your room to the café. You can even connect WiFi devices that don’t support VPN, like your Chromecast or Pebl. 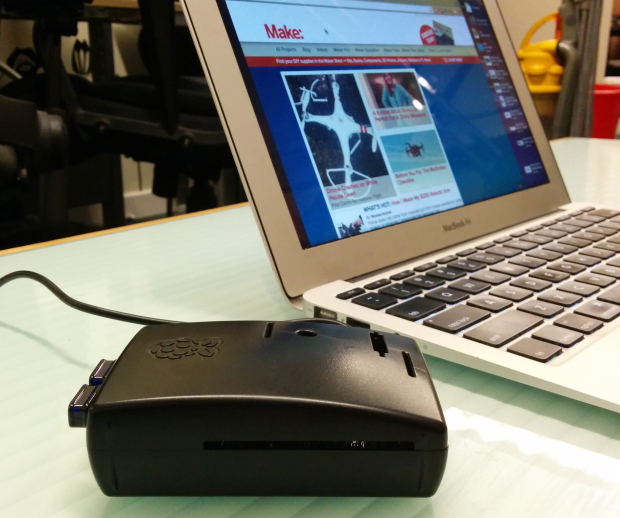 The project consists of a Raspberry Pi, two USB WiFi dongles, an SD card, and a power plug. If you don’t have Ethernet available, your router can connect to a WiFi network in addition to creating its own, acting as a bridge between your personal WiFi access point and an insecure WiFi. The range of this router is just enough to fill a single room. Once built, any WiFi device has a passive VPN connection. If the VPN connection disconnects, so does your connection to the internet, guaranteeing that unencrypted data is not leaked. If you are so inclined, we can set it up your router to support TOR, so that you can dive deep into the internet within the internet. Using open-source software, we can handle WiFi connections from your devices, connect to another WiFi access point, and encrypt your internet through a VPN anywhere you are. When your friends come over, they will also be on a secure Internet connection, even if they don’t know how to set one up themselves. Additionally, you can access Hulu, Netflix, HBO, or your favorite team’s game while traveling overseas. If you want to take it further, you can add domain-based ad blocking using bind to stop web advertisements dead in their tracks. Enjoy setting up your very own portable WiFi VPN/TOR router!